Songwriter Seth Swirsky grew up idolizing the Beatles. He set out, video camera in hand, to talk to people who had crossed paths with his musical heroes. From Sir Ben Kingsley to Sir George Martin to Beach Boy Brian Wilson to astronomer Brian Skiff, Swirsky filmed hundreds of personal recollections from people who knew them well to those who just had an unforgettable encounter. Beatles Stories provides a fresh and engaging window into the lives of Paul, John, George and Ringo and we learn something about the Fab Four through the memories of those lucky enough to have met them. 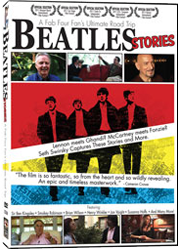 Longtime Beatles friend and personal assistant Tony Bramwell calls Beatles Stories, "A Magical Mystery Tour De Force!" and Cameron Crowe called Beatles Stories, "An epic and timeless masterwork". Please join us for a special screening of the film, as well as a panel discussion featuring Swirsky.